Fashion Life is yet another unnecessary program that masquerades as something brilliantly unique. However, we regard it as an adware program, because its functions include promoting certain fashion-related websites, displaying shady advertisements and obtaining information about its own users. There are no added benefits to having this program installed. We recommend bookmarking its promoted websites that you like and remove Fashion Life from your computer entirely, because there is no way of knowing which ads are be legitimate and which might not. Note that the ads are presented inside the browser. So join us as we analyze this program is an effort to shed light on its shady practices. As per usual, an adware’s developers are nowhere to be found. You can contact this program’s administrator using the email address provided at its website, but the website itself does not provide any information regarding this program’s origins. This only adds to the mistrust surrounding Fashion Life. From what we have gathered, it seems that this program’s developers or owners utilize two methods for distributing it around the web. There is nothing to innovate about them. Of course, Fashion Life has its own website at Fashionlifeapp.info that contains its standalone installer. The second method is an adware developer favorite. It is called software bundling and it involves packing several applications into one installer. The installation of additional program can be omitted in most cases by opting for custom settings. Now let us move on to what this program is capable of. 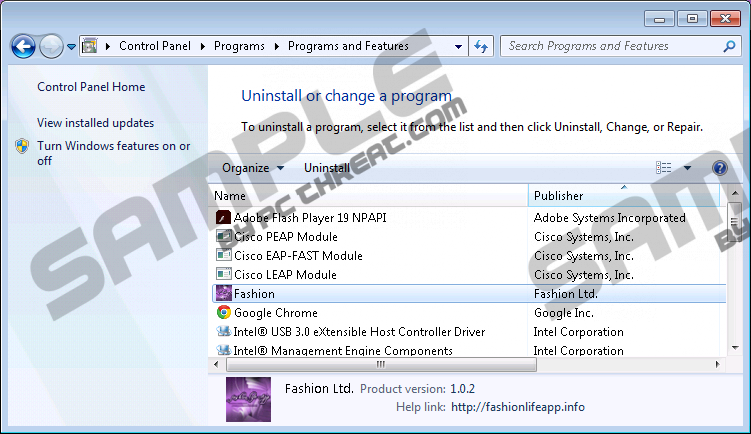 Fashion Life may appears to look legitimate, because unlike many adware programs that come as background processes, browser extensions or a combination of both, this particular adware program comes as a background process/Windows Gadget. Note that Microsoft discontinued gadgets as they have serious security vulnerabilities, so this program must be viewed with suspicion. So vulnerabilities in this gadget can allow remote code execution which means that a hacker can use this gadget to take complete control over your computer. This is very serious and you should not leave this program as is. Now, let us take a look at how this particular gadget works. As expected this gadget’s Fashion News section features links to fashion-related websites, such as Img.com, Fashionworldwide.net and five other links to similarly themed websites. The second section called Fashion Forum features links to fashion-related forums, such as Askandyaboutclothes.com. The last section called Social links features links to social networks, such as Facebook, Twitter and Google Plus, and that is all there is to this section. Over all there is nothing to complain about, but the fact that this gadget can be exploited is a huge concern and we recommend that you remove Fashion Life. Furthermore, this program is known to display typical advertisements on your browser that are very annoying and are apt to obstruct your browsing experience. And, there is no way to determine whether its advertisements are legitimate. For all we know it might promote fake online shopping websites. So do not hesitate to remove Fashion Life from your computer for good. Identify Fashion Life and click the Remove button. Identify the undesirable program and right-click on it. Find the adware program and Uninstall it. Quick & tested solution for Fashion Life removal.